The third and final volume in Blizzard’s exhaustive history of Azeroth comes out on March 27. Dark Horse Books slipped us a few pages from World of Warcraft Chronicle Volume 3 to give us an idea of what to expect. The first volume dealt with the formation of the universe and the rise of ancient races. The second spent a lot of time on the other side of the Dark Portal, futzing about with orcs, draenei and demons. Volume 3 gets us to the good stuff—the Lich King, the Black Temple, the fall of Cenarius. These are my favorite bits, and you can see how World of Warcraft Chronicle Volume 3 presents them in the slideshow below (click to go fullscreen). Pages 30 and 31, covering Kel’Thuzad falling under the thrall of the Lich King, like a dope. Pages 96 and 97. in which Magtheridon is bound. The secrets of Chapter IIII shall soon be uncovered. 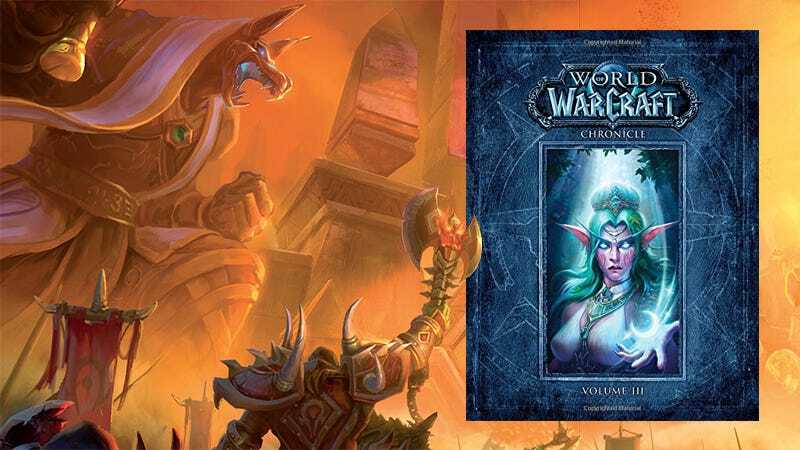 World of Warcraft Chronicle Volume 3 hits stores on March 27. It costs $40, but not really.